One must love this record - not only because of the great Merle Haggard cover version but also because of the nice label design. I bought this one from Mack Stevens, a record collector and rockabilly musician from Texas. There's nearly no info out there on Willie Gregg and the Country Kings except that this is some really great Country Bop. 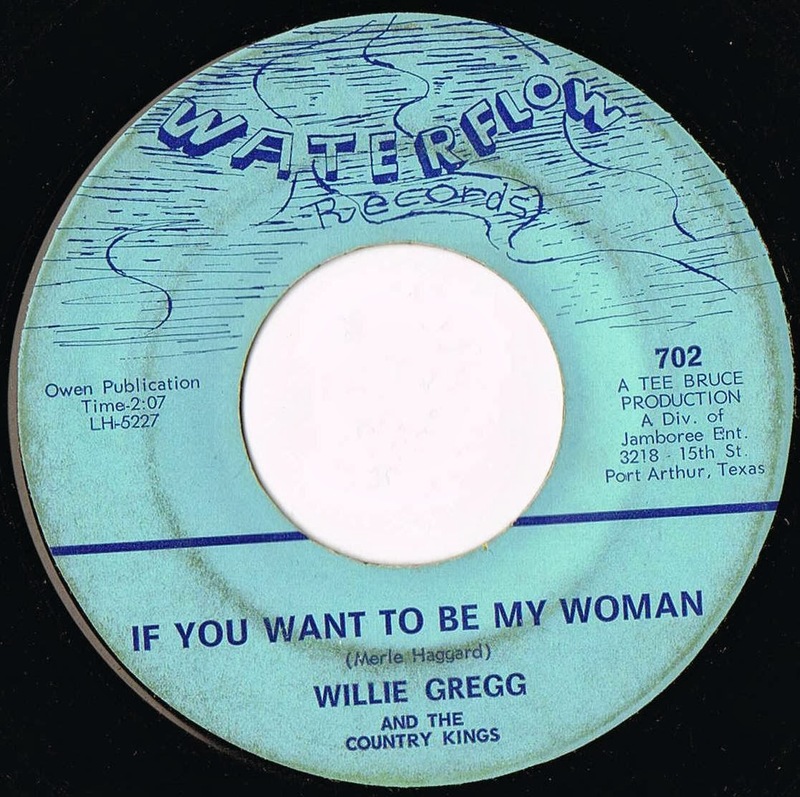 Gregg had another release on the Kay-Bar Dane label out of Orange, Texas, featuring the slow ballad "You Fool" in 1960, credited to "Willie Gregg and the Velvetones." Producer of the disc Tee Bruce, whose real name was John Lloyd Broussard, played a major role in bringing Cajun music on the radio in Texas. He hosted several shows on local stations, including the "Cajun Jamboree" on KOGT in Orange, Texas, by 1965. He also had a record label called Cajun Jamboree and Waterflow Records was definitely also owned by him. Jamboree Enterprises, located on 3218 15th Street in Port Arthur, Texas, as stated on the label, was a Tee Bruce venture. Both the Jamboree Ent. as well as the Waterflow Publishing is also shown on Cajun Jamboree record labels. Bruce died March 18, 2010, at the age of 81. The record was pressed by Houston Recorders from Houston, Texas, in 1969. The "LH" prefix in the matrix number tell us "Location Houston." Information on Tee Bruce taken from John Broven: "South to Louisiana - The Music of the Cajun Bayous"
Never heard of this label. It's from 1969. Thanks! Where do you got that info from? Could this be the very same Willie Gregg? Hi Johnny, I listened to that record and I'm quite sure it's the same singer!